Audi Athlone has announced details of the Audi ‘Future Now’ 181 sales event, offering motorists exceptional offers on 181 cars across the entire range. The event includes the new Audi Scrappage EcoGrant scheme as well as upgrade packages tailored to meet the lifestyles of both existing and future Audi drivers. The Audi Scrappage EcoGrant offer - with incentives up to €6,500 - is open to owners of diesel Euro 1 - 4 emission standard vehicles or below, and is available to owners of all makes of cars. The Audi Scrappage EcoGrant offer is available with Audi’s attractive PCP finance rates and exclusive equipment pack offers that are available across the range. The upcoming sales event will allow motorists to experience the latest technology and design innovations that are available throughout the Audi Athlone 181 range. 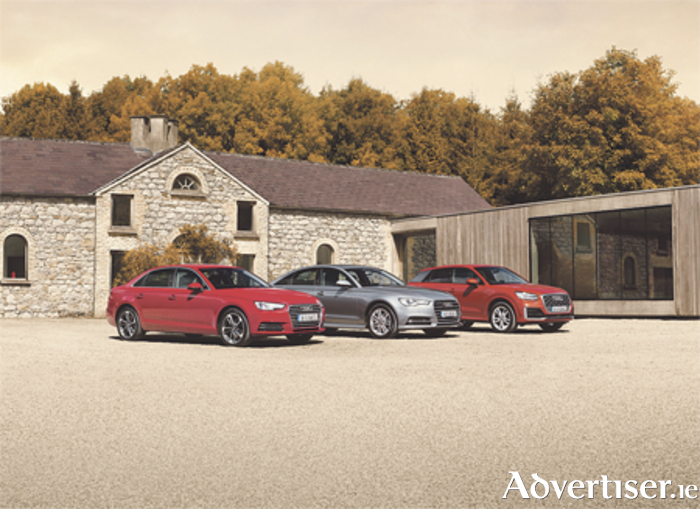 The striking Audi A4 model boasts a range of upgrade packs. The sporty yet sophisticated A4 SE Edition 50 upgrade package includes a metallic paint finish, 18” alloy wheels, ambient lighting pack, front parking sensors, comfort armrest and heated front sports seats, all available for €1,500. This represents a customer saving of more than €3,200. The Audi A4 is available with an Audi Scrappage EcoGrant offer of €5,000 and from €359 per month PCP. The iconic Audi A6 comes with a number of exceptional upgrades, such as the Audi A6 SE Comfort Pack, which includes 18” alloy wheels, MMI Navigation Plus with touch pad, smartphone interface, reversing camera, LED interior lighting package and wood inlays. This package is for a limited time only available for €1,200 - presenting a saving of more than €6,200. Furthermore, the striking Audi A6 S Line model is available with a similar Comfort upgrade package as above, with additional features such as 19” alloy wheels, flat-bottomed steering wheel and Valcona leather finishing. At only €1,200 this upgrade package represents a saving of more than €6,600. The Audi A6 is available with an Audi Scrappage EcoGrant offer of €5,500 and from €439 per month PCP. At the heart of the Audi brand is its commitment to delivering an unrivalled total customer service experience. As part of the ‘Future Now’ 181 sales event, customers can also avail of an exclusive five-year/120,000km Audi Complete Drive Service Plan package from only €19 per month. This service plan offers customers extensive maintenance cover, and with the Audi Complete Drive Service Plus package also including ‘wear’ items, Audi drivers can enjoy a complete and worry-free owner experience. For further information on the Audi Future Now 181 sales events contact one of the dedicated Audi Athlone sales team on (090 ) 6403900 for more details. The offer runs from October 9 until December 31, while stocks last. Terms and conditions apply.